During winding, the mainspring barrel is stationary and the ratchet wheel winds the inner end of the mainspring counter-clockwise around the arbor in the center of the barrel. 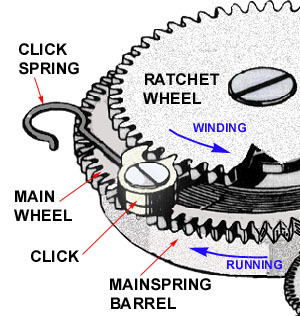 When the movement is running, the ratchet wheel is stationary and the outer end of the spring rotates the barrel clockwise. The barrel (and integral main wheel) drives the center wheel pinion gear. While the movement itself prevents the mainspring unwinding from the outer (barrel) end, the ratchet prevents unwinding from the inner (arbor) end. The click is thus designed to prevent the ratchet wheel from rotating clockwise while allowing counter-clockwise movement (for winding). The click spring maintains tension on the click in the clockwise direction. The very typical two-toothed click design, illustrated, prevents the click from holding the mainspring at absolute full tension. When the crown is released after winding, the click is rocked counter-clockwise (against the click spring) by the large tooth and the small tooth engages and locks the ratchet wheel. This allows the ratchet wheel and arbor to rotate slightly clockwise. This action relieves a bit of tension in the mainspring and prevents excessive tension that might cause the transmission of too much power to the gear train and, thus, knocking of the balance wheel.